Whatever size you are we can accommodate your needs. Our years of experience has found the most popular size of hats is large, followed by extra large, medium, XXL, then small. 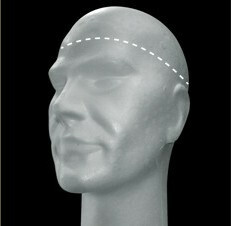 Please see the sizing guide below – for hat size the measurement is the circumference of the head at the largest part (forehead to forehead as shown).